Andorra is a region that is well known for its excellent snow sports, and as the school is located only 10 minutes away from the ski slopes, all students from Early Years to Post 16 can participate in the school’s ski programme. During the winter season, students are divided into small groups categorised by ability level, and ski for one day a week. Classes are taught in English by qualified ski instructors and pupils’ levels of skill and confidence increase dramatically throughout the course of the season…. and it’s great fun too! Due to the school’s incredible location, we are lucky enough to be able to offer skiing as part of our mainstream curriculum. 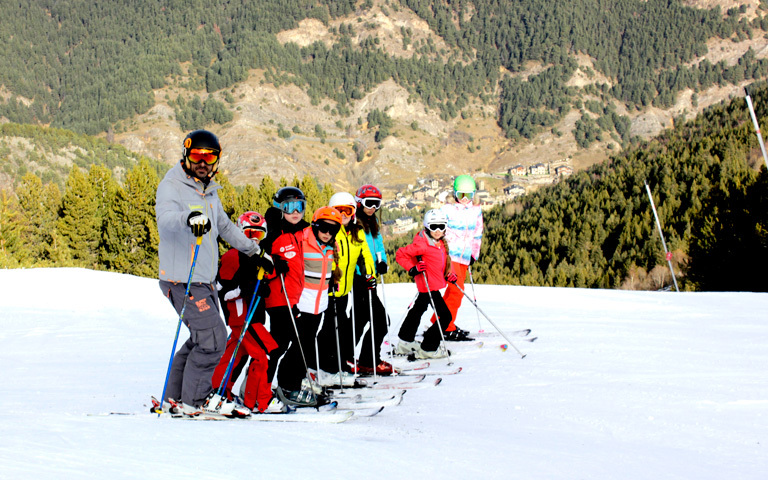 Ski groups are organised by ability level, with a maximum of 6 or 8 students per class. Children are taught by qualified, ski instructors from the Valnord Ski School and all classes are taught in English. Agora Andorra’s ski programme provides exceptionally high-quality ski training alongside an excellent academic education. The school uses a clearly defined evaluation system and takes the progression and development of each skier very seriously. Students are able to participate in 11 or 12 curricular ski sessions as opposed to only 5 sessions offered by other schools in the area, and we have an excellent rapport and advantageous arrangements with the private ski schools.